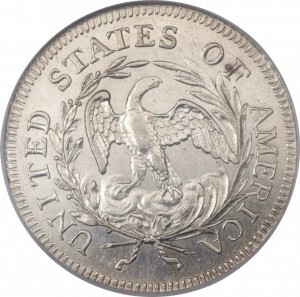 The 1796 Small Eagle reverse is the most rare date of the Draped Bust Quarter Series. It’s value starts at or near $10,000 in the lowest grade. The next rarest date is 1804 and it’s worth around $4,000 in the lowest grades but all other grades can be found in the $500 in the grade of good (G4-G6). Grade is important in value and for each grade value increases dramatically. The 1805 is worth $500 in G4 but the same date in MS60 is worth over $10,000. However, higher grade coins are valuable for a reason so they’re rare and difficult to find, and most Draped Bust Quarters are in low grade and even damaged. No proofs for this type and denomination so proof like coins are going to bring a higher premium. Draped Bust Quarter value is determined by mintage, survival rate, condition and grade. Learn the value of Draped Bust Quarters.